I hope the woman isn’t the infant in his arms. Squick! That halo looks a bit out of place. The insect people clothing implies some rather unlikely physiology, unless the plot required Harvey Weinstein aliens. You don’t seem to know much about babies: that’s the rocket. He may not be the woman, but he’s wearing her skirt. So this is the masterpiece that finally got Gordon “The Gord” Dickson coronated—it’s Gordon Rex! @FB: …I suppose I don’t know much about babies! Order a man and a woman to pilot the first space-ship, disregard the fact that they hate each other, overlook some of the terrifying secrets of outer space, and what you get is the basis of one of the most exciting interplanetary adventures ever written. Goodness, there can be a worse blurb than “First Book Publication”! @Dead Stuff (10): So the Mantisoids are backing off because they didn’t realise this was a Romcom from 2006. It’s not the baby that grosses them out, it’s Jennifer Aniston. @Tat Wood—would that be the legendary Three Bugs and a Baby ? Directed by Leonard Nimoy in order to bring the worlds of sci-fi and romcom together, and a tour de force of thoraxes and cuddles! @B. Chiclitz: it had alternate endings, as I recall, one where the baby ate the bugs, one where they ate the baby and a third where the baby started talking like Bruce Willis. All more plausible than ‘Three Men and a Little Lady’ and its idea of Englandland. Rex also wrote First on Mars. Is this part of a series? Do they all rhyme? I don’t know where the woman is, but I found the spaceship hiding in plain sight. 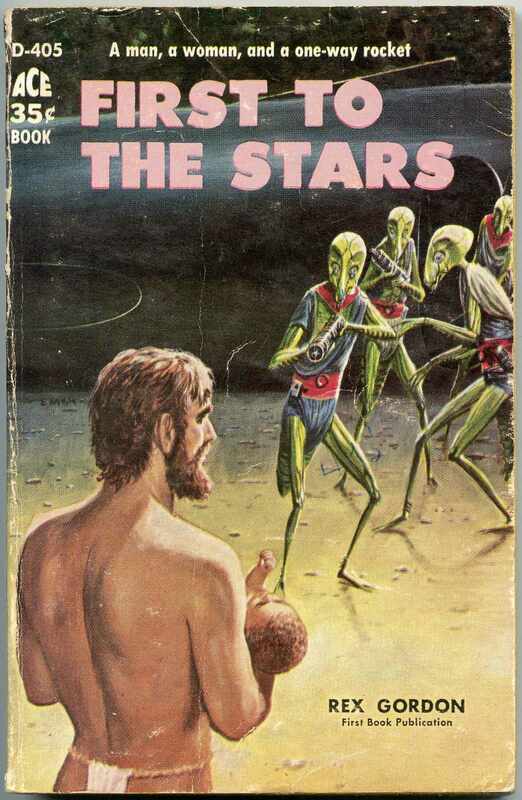 I have to wonder if the aliens are staring at that guy with such revulsion because he’s wearing his loincloth backwards. If you reversed the position of the white family man and the aliens, you would have an accurate depiction of Republican perceptions of American immigration policy. Trousers, nope, not for any species. Baby, unmentioned in blurb, and as everyone else said, we hope that’s not the woman. Can’t figure out how the mantisoids get those leotards on. Must be bodysuits and we just can’t see the snaps. Must admit that a man with long-ish hair, beard, and baby is remarkably forward-looking for 1959, yay Emsh. To say nothing of the thong. Brendan never twigged to the fact that Swift’s Modest Proposal was intended as satire. @DSWBT: And speaking of that cover, the re-creation guest-starring ME will arrive tomorrow! I’ll send it to Tag Wizard. And last to the wardrobe.